"This is tender, fall-off-the-bone roast beef with mushrooms. It's perfect as-is. Shred the leftovers for cheese steak sandwiches." 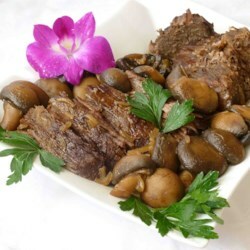 Place the mushrooms in the bottom of a slow cooker; set the roast atop the mushrooms; sprinkle the onion soup mix over the beef and pour the beer over everything; season with black pepper. Set slow cooker to LOW; cook 9 to 10 hours until the meat is easily pulled apart with a fork.